Beacon Hill Tuff Formation at Charnwood Forest, Leicestershire with low-lying Triassic terrain in the distance. P667854. Neoproterozoic rocks can be seen in Anglesey, Caernarvon and Lleyn in north-west Wales. In south-west Wales they are exposed around St David’s Head, towards Milford Haven and eastwards, possibly across a terrane boundary, near Carmarthen. They crop out in inliers—areas surrounded by younger strata — across central England from Shropshire to Leicestershire where they give us an insight into the ‘basement’ geology. On Anglesey and Lleyn the Neoproterozoic rocks are low-lying in comparison with the adjacent terrain. But in England they stand proud of the softer rocks of the surrounding countryside and form distinctive steep-sided hills or ranges such as the Malvern Hills, Pontesford Hill, The Wrekin near Shrewsbury, and Charnwood Forest in Leicestershire (Plate P667854). The Neoproterozoic rocks have a long history of deformation, and consist of metamorphic rocks that originated as sediments, volcanic rocks and intrusions. In England and Wales, many of these rocks show sedimentary features indicating that they were deposited in a sea that lapped around a volcanic landmass. The parent magmas were comparable to the magmas of volcanic arc systems of the type (calc-alkaline in composition) found today where oceanic and continental crust collide; a modern example is the western part of the Pacific Ocean. Volcanic material was erupted onto the sea bed or on land, perhaps forming extrusive domes or large strato-volcanoes. The slopes of these edifices were unstable and eventually collapsed causing mud slides and debris flows that sloughed away to be redeposited elsewhere on the sea bed, and thus may be preserved interbedded with other marine sediments (Plate P601562). Palaeomagnetic studies and other evidence show that Wales and England were located in a province (Avalonia) situated on the ‘leading edge’ of the Gondwana supercontinent that was bordered by a subduction zone active between about 700 and 560Ma; Figure P785799a). In north Wales near Bangor, about 2000m of ash-flow tuffs are preserved (Plate P007261). 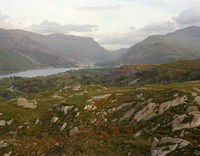 These are the Padarn Tuff (Xtf)† — consolidated ash that was erupted from a large volcano. 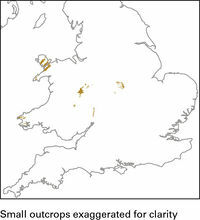 The tuffs have been dated at 614Ma, and are part of the Arfon Group. Andesitic volcanic breccia in the Charnian Supergroup. P601562. Llanberis Pass: Padarn Tuff in the foreground and Llanberis slate quarries in the middle distance. P007261. Ash from a recent pyroclastic flow eruption on Montserrat. P063592. In south-west Wales, the Neoproterozoic rocks are mafic (basalt and andesite) and felsic (rhyolite) lavas with tuffs and associated sedimentary rocks—the Benton Volcanic Group (Xtf ) of Milford Haven and Pebidian Supergroup (Xlv) of St David’s. Just west of Church Stretton, the largest of the English outcrops of Neoproterozoic rocks is the Long Mynd inlier, with other outcrops at The Wrekin, Caer Caradoc and Kington. Igneous and sedimentary rocks are divided into the Uriconian Group (1333m thick) and the younger Longmyndian Supergroup (6900m thick). Both volcanic and intrusive rocks are present in the Uriconian Group (Xlv ; Xtf ), and show a characteristic range in composition that includes rhyolite, andesite and basalt. The Rushton Schists (X) crop out within strands of the Church Stretton Fault and are likely to be much older than the Uriconian volcanic rocks that are dated at about 566Ma. The Longmyndian Supergroup is composed predominantly of sedimentary rocks (Stretton and Wentnor groups), but includes some tuffs. These sedimentary rocks preserve a change from a marine (mudstone and turbiditic sandstone) to a ‘continental’ fluvial environment (deltaic sandstone, alluvial sandstone and conglomerate) recording a marine regression. To the east at Nuneaton is the Caldecote Volcanic Formation (Xtf ), another bedded succession of tuffaceous sandstone, siltstone and mudstone. In Leicestershire, the Charnian Supergroup (over 3800m thick) also contains volcanic rocks (Plates P667854 and P601562) erupted from a volcano similar to that on Montserrat (Plate P063592) and here the intercalated sediments suggest deposition in deep water beyond the influence of storm waves or tidally induced currents. The lower Blackbrook Group consists mainly of volcaniclastic turbidites (X). The Maplewell Group contains thickly bedded tuffs and breccias that were probably derived by the collapse of volcanic domes. 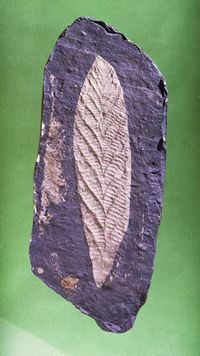 Ediacaran fossils (including Charnia, see Plate P550159) have been found preserved in siltstones of the Maplewell Group. These enigmatic forms that flourished in the late Neoproterozoic disappear at the base of the Cambrian, and have no clear modern equivalent but some show an uncanny resemblance to flattened jellyfish. The topmost unit of the Charnian Supergroup is the Brand Group that is now regarded as Cambrian in age. 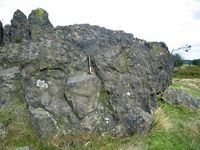 The highest grade of metamorphic rocks in England and Wales is found on Anglesey in the Penmynydd schists. The rocks are varied, and include pelite, gneiss and amphibolite, which are intruded by felsic rocks of the Coedana Complex, dated at 614Ma. Blueschist (glaucophane and hornblende) occurs within the Lleyn–Menai Strait Fault Zone. This type of metamorphic rock is typical of high pressure and low temperature conditions such as would be associated with a subduction zone where crustal plates collide and one plate is pushed down beneath the other. They are interpreted as the relict of oceanic basaltic crust and associated deep water sediments. The plutonic rocks of this period commonly occur in fault-bounded blocks, and paradoxically some may be older than the sedimentary and volcanic rocks around them. They are metamorphosed, but the composition indicates that the site of origin had changed from ocean floor to continental margin. The Sarn Complex (614Ma) on the Lleyn is mainly felsic (granite) but also includes diorite and gabbro. 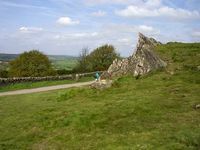 Other plutonic rocks of Neoproterozoic age are the Johnston Complex (643Ma) of south-west Wales, and, in the Welsh borders, the Stanner–Hanter Complex (702Ma) and Malverns Complex (680–670Ma). The youngest intrusions, which clearly postdate the surrounding volcanic rocks but are unconformably overlain by Cambrian strata, are the Ercall granophyre (560Ma) in Shropshire and the Nuneaton diorite (603Ma) farther east. The Neoproterozoic inliers are associated with major fault zones, the Lleyn–Menai Strait Fault Zone in north Wales, the Welsh Borderland Fault Zone that includes the Pontesford Lineament and Church Stretton Fault, the Malvern Lineament of Worcestershire and Gloucestershire, and farther east the Polesworth Fault at Nuneaton and the Thringstone Fault at Charnwood. Some of these faults define terrane boundaries (Figure P785833), and have been reactivated during subsequent orogenic and rifting events, playing a significant role during the Palaeozoic, Mesozoic and Cenozoic structural evolution of Wales and England. This page was last modified on 28 July 2015, at 17:00.